This little journal is a gift I made for a friend. It was in celebration of her fabulous 40th birthday. 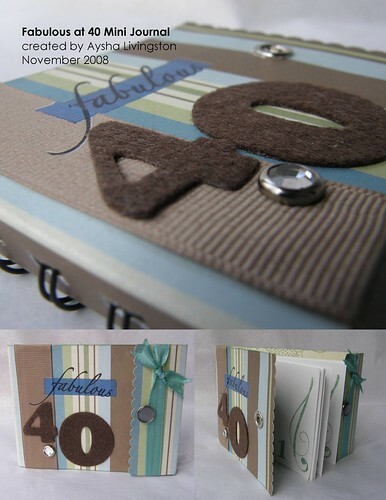 I really enjoyed making this book as I got a chance to use one of my favorite tools, the Bind-It-All. I also used the companion tool the Dreamkuts (which allows you to cut many pages to the same size with ease). The flip style cover is always fun and this was my first time positioning the spirals towards the back of the cover. Not sure if I explained that well. But, if you look at the book from the front you don’t see the spirals, so it has a cleaner appearance. This journal is HOT!!! Sorry but I am straight jacking your creation as I think about how I am going to celebrate my 40th birthday. It is ab-fab!! As always…great work! Enjoy the Holidays with your loved ones.